Everyone has tried learning a foreign language the traditional way by going to a school to learn. One of the bummers of the traditional approach is having to take into account the travel time to and from the lesson! You might have to plan at least an hour and thirty minutes ahead just to get to class! If you just don’t have time for this whole process, there is another practical option for those people who are always on the go. 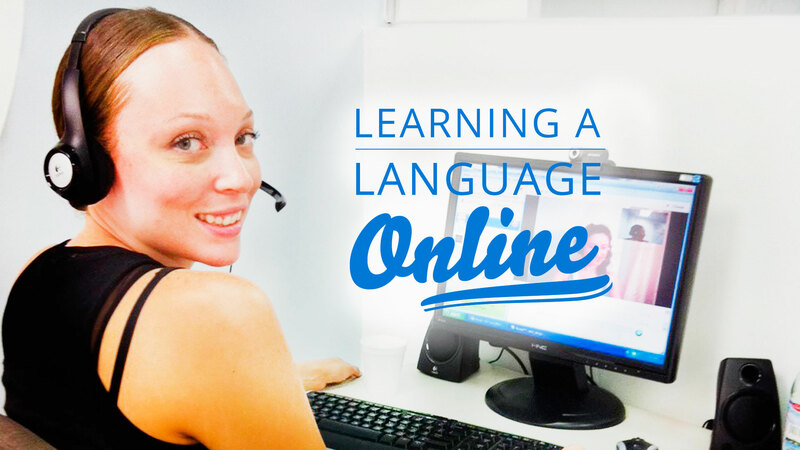 You could have your language lesson online through a number of applications, most namely Skype. Why you should learn a foreign language online! Learning a language online through Skype, Facetime etc. is less time consuming for those of us who are always “on-the-go”. You don’t have to worry about managing your time as much as you do when you have someplace to be. With the rise of different mobile applications, you can have an online class while you’re sitting in traffic (as a passenger of course), while you’re cooking or even while you’re on your break at work. I have plenty of students who run their own businesses and practically have no time to stop for a breath. One of my students has a little down time when he get’s to work in the morning, so at 7:00 am we connect for an hour and a half for an online accent reduction class. He has the same book as I do, and we practice until his daily meetings begin. I even have students in Brazil, Russia and Italy. We coordinate the times for the lessons, since they are in different time zones. It’s really efficient and allows me to “visit” many countries in a single day and help those foreigners who want to learn from a native English speaking teacher. In contrast to being in a traditional classroom where there are numerous aids to help with teaching/learning the language, having class online makes learners rely on their voice and your voice. From the perspective of the teacher and the student, you have to make sure your pronunciation and tone helps the other person understand what you’re saying. Imagine you are in a class, and because the person doesn’t understand you, most of the conversation consists of “what?” and “huh?”. A teacher is more limited in tactics for teaching, but this also causes the student to focus on the lesson more. It’s true what they say, “no pain, no gain”. Studying on Skype feels very natural and comfortable, which will helps the student open up and speak more. One student of mine who is very good at grammar is very shy when it comes to speaking. So, I suggested that we have skype classes just so she actually uses what she’s learning and practices speaking more. Our Skype classes have made her more confident in speaking. She doesn’t feel like anyone is judging her and I’m happy to have assisted her in overcoming that obstacle. When you are learning a language online, you can easily send links to pictures or videos related to the topics that you are talking about. You can also send definitions to words by copying and pasting them into the conversation. It’s easier if you’re both on PC’s and not just on your phone or tablet . My favorite aspect of online classes is showing the student pictures of what I’m talking about when they don’t understand my explanation. However, I first give the student the chance to try understanding just from my explanation, because I want them to be proactive learners. You’ll never learn anything if you don’t try to figure out things for yourself! So, yes having traditional classes will continue being a great option, but don’t rule out newer ways of learning. As stated before, class online is practical in that it’s less time consuming and convenient, it builds confidence because it relies mostly on speaking, and you have the internet at your fingertips to back everything up. Give it a try. This is what our students say! As I said have many times, learning English with native speakers was a life changer for me. What I learned back home in Argentina, was just repeating dialogs and read predefined sentences from English books. It was just structured English, not life and modern english conversation. At the very first moment that I arrived in Miami, in the airport, I had the bad-luck (or should I say good luck, after all), to speak with an non-Spanish speaking customs agent. In Miami, I think this happened just to me! But, I was so “proud” of my English that I had learned at the high-school and also the English institutes that I attended, that when the agent started to ask me the regular questions, I thought “piece of cake”… but the moment I started to speak, he was…. “What ?”, “Sorry, but I don’t understand”, and I was just furious… how couldn’t he understand me, after all those years learning English?!?!? The thing is, that the real world is not prepared for your pre-built “English Book dialogs”, like “Hello, my name is Francisco.”, “How are you today?”, or “I’m fine, and you?”. You can’t have a normal conversation unless you learn how to speak REAl English, and the only way to do this, is by learning with Native teachers that DON’T SPEAK YOUR LANGUAGE. So, I was in Miami, speaking English like an old teaching book, feeling the frustration of not being able to express myself… and that was the moment I decided to learn conversational English. I started with Language On in a group English course, with two Russians, two Italians, a Spaniard and a Brazilian… a nice international mix, right? We spoke in Spanish with the Spaniard women, but with the rest (even more the Russians!!!) I had no choice than to speak English, period. I couldn’t guess ANY word in Russian, none, nothing! This was pretty helpful, because it’s the only way you can learn how to speak a language: talk, talk and more talk. The time passed, and I evolved! From an old English teaching book, I moved to someone that was able to express themselves in English and have a smooth conversation. This was a before and after, not only in my professional life, but also in my personal experience. We went to bars, hung out at the beach… and everything was in English! My English learning process was awesome, but a storm appeared on the horizon: I had to come back to Argentina… so, my English learning process would be stuck and maybe even go back to how I had been. To cut a long story short, my solution was studying English online. I was I little concerned about how that would be, after being in a classroom, with students from all over the world, but it was great. Me and my personal teacher focused just on the things I needed to take my English to the next level, and after 4 months I could say that I can had a business conversation in English, and also talk to Americans and my British friends with no problems. Am I a biligual speaker? Not yet, but I’m getting closer every month on Skype! I turned my language on! I studied English all my life. Every year I spent hours and hours per week studying verb tenses, phrasal verbs, passive voice, reported speech, conditionals and all that things that I´m sure that you already know. I made a lot of exams and passed everything with success. I also could read books and see films without problems. That´s how in the beginning of 2015 I ventured on a trip to Europe. My first BIG trip to the old continent. I had a lot of different expectations, doubts and fears, but my English level wasn’t one of them. If I had done everything that I should in order not to have problems communicating in English, why would worry about that? However, the day that I arrived in Copenhagen (my first destination in Europe), I realized that my idea about my English level was wrong. When someone asked me something I didn’t know how to answer. Sometimes because I didn’t understand what they asked me (I noticed that my vocabulary was really poor), other times I understood what they said but I had to take a lot of time thinking how to answer them, making me nervous that I would finish with the famous “eeeeeeeeh, yes eeeeeeh well” and not be able say anything. Now I can tell you how I improved my vocabulary, pronunciation and my English in general, but to explain to you how my classes were I prefer tell you one situation that I will never forget. In one of my first classes, after greeting Chris, he asked to me how the weather was and I answered “good, the weather is good”. So he said to me “ok, but give me more details about the weather, use some other ways to say that the weather is good”. To be honest my reaction was “Oh man, what’s happening with you? Good, bad, it doesn’t matter how the weather is, begin with the class please!” (Yes Chris that’s what I thought. Sorry!). I think he noticed that in my face, because after that he continued saying “I know that there isn´t anything special with the weather and it’s not an interesting topic to talk about, but it is one of the best ways to start a conversation with someone that you don’t know”… and he was right! That was what I needed at that moment, to see examples and situations of REAL LIFE. Not study the same thing that I had been studying for the last 10 years. Today, less than one year after that experience, I can say that he helped me ENJOY my trip. I met a lot of great people and made friends in the differents countries that I visited, and if I had been able to tell them how the weather was, I never would have gotten to know them.